Kensington is a small town in a big city. 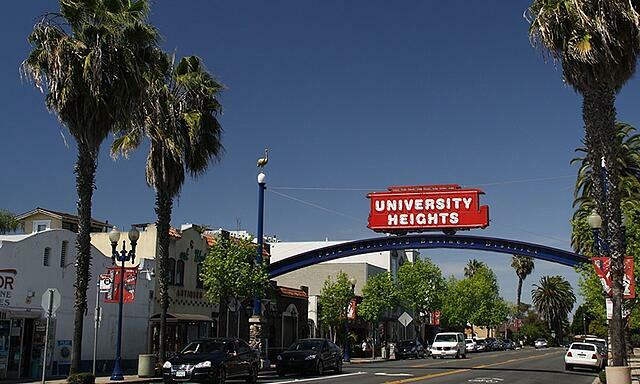 This diverse and historic neighborhood is considered one of the most desirable older-urban mid-city neighborhoods to live in. 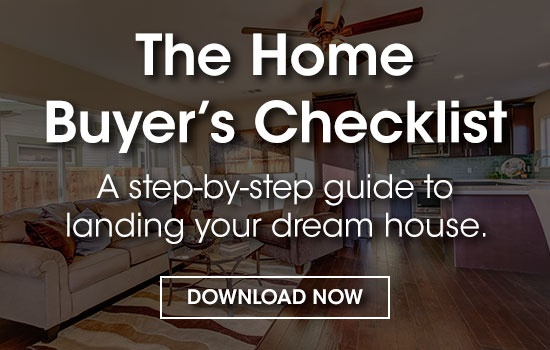 The neighborhood is like one big peninsula bordered by Interstate 15, Interstate 8, Fairmount avenue and Monroe street. The area is filled with the beauty of solidly constructed old-style houses, decorative lamp posts, sidewalk stamps, one hundred year old trees, and a quaint business district. 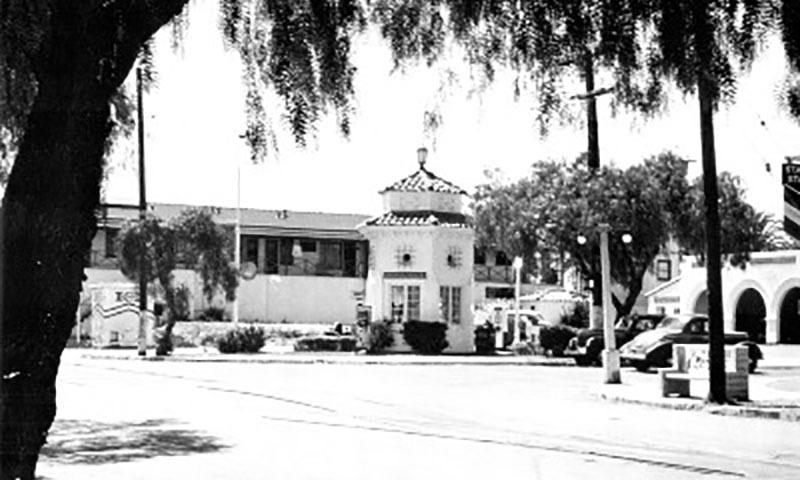 Founded in 1910, what was once known as Kensington Park was sold by the two sisters that owned the land to executives from the Santa Fe Railway Company. This exchange brought on subdivisions and growth that spanned to what is now known as Kensington. 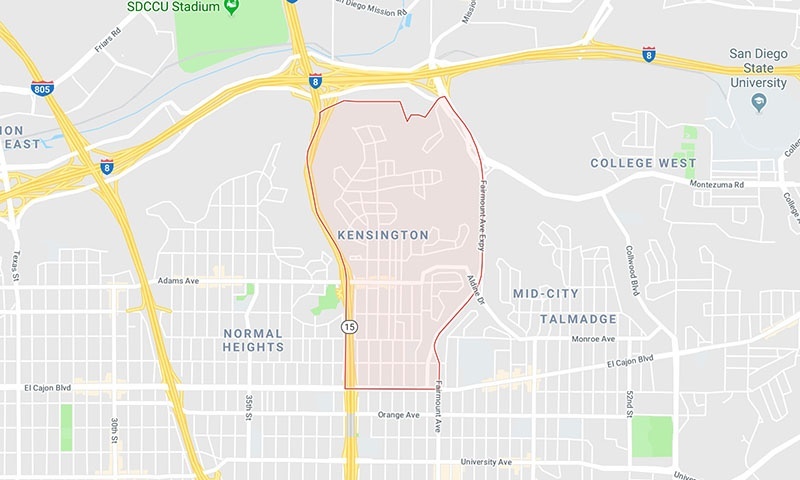 From its beginnings, Kensington was serviced by route 11 of the San Diego Electric Railway via a wooden trestle bridge across Ward canyon. Automobile access was added in 1913 when a second bridge was built. During the time of its service, the line ran several historically notable streetcar designs which include the San Diego Class 1 StreetCar–the first “pay as you enter” and “The Presidents’ Conference Committee” design in the nation. 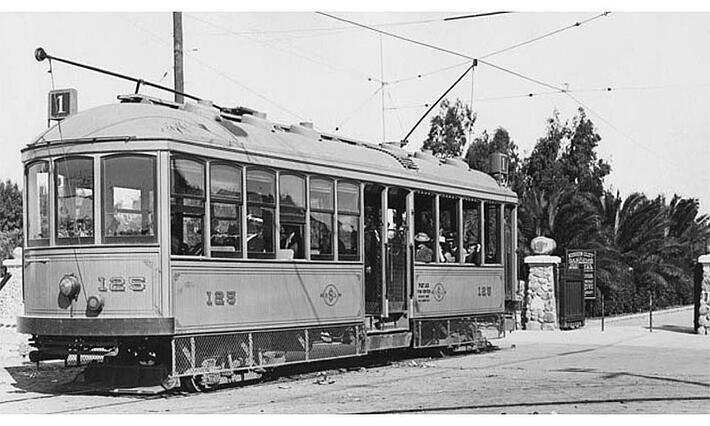 This street car service continued until 1949 when the last of the San Diego street car lines were abandoned. 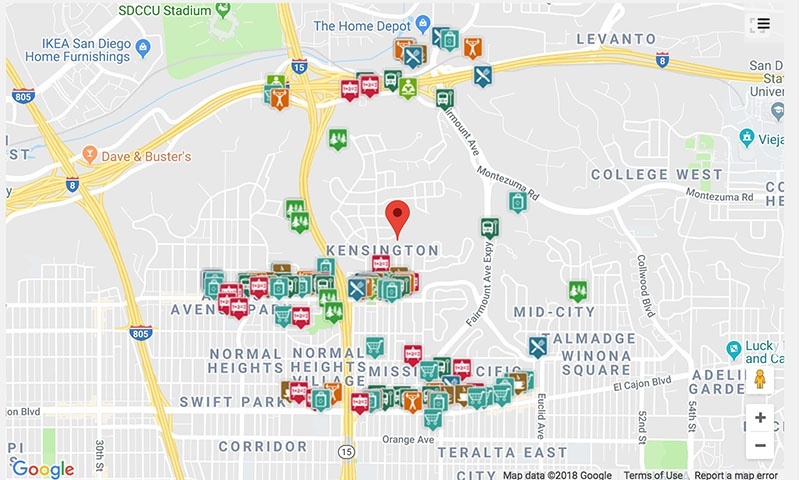 photo credit: heartofkensington.org - "Old image of Adams Ave. and Marlborough Dr. circa 1947"
One of the oldest neighborhoods in San Diego, this interactive map shows the location of all the historically designated resources in Kensington. 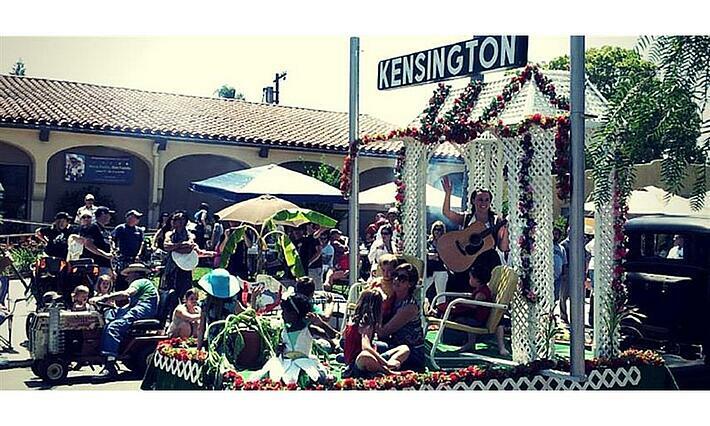 With a population just over 16,000, Kensington has maintained its small town feel since the beginning. 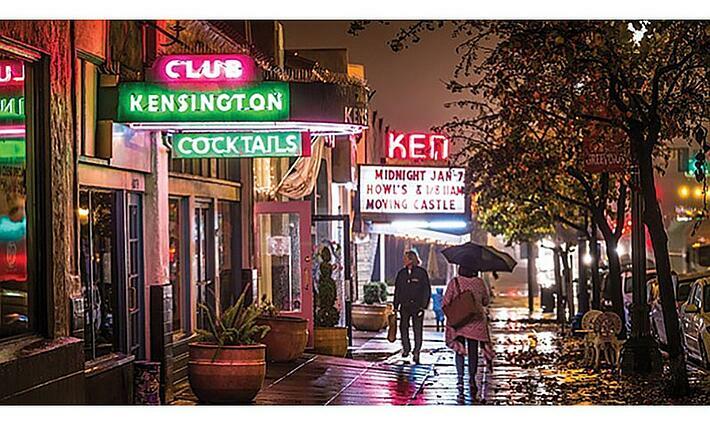 A neon "Kensington" sign hangs over Adams Avenue, which acts as the neighborhoods cultural and business center. For anyone new to the area, the big neon sign will signal your arrival at the center of the neighborhood. Kensington was rated #8 of 50 most diverse neighborhoods and places to live in San Diego as per niche.com as of 2017. 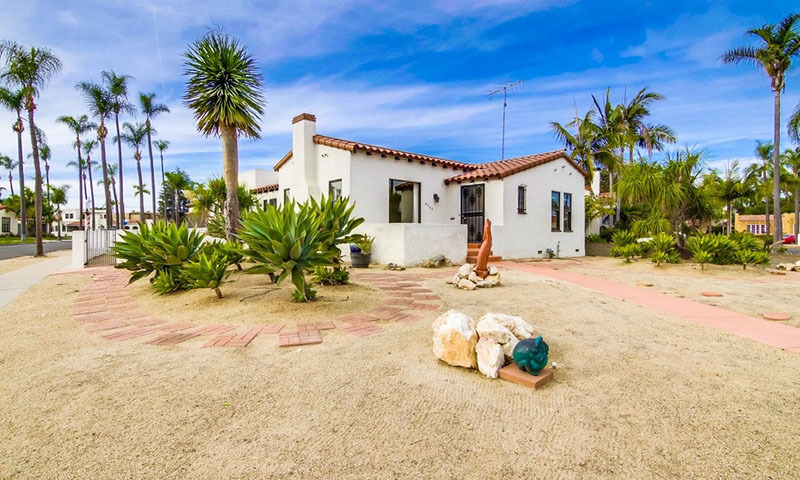 The homes in Kensington are all unique in comparison to other areas in San Diego and all have a distinctive individuality acquired over generations of proud home ownership. Most of the homes here exude character and have garages that back into the alleys which creates a wonderful pedestrian-friendly community where everyone walks and knows their neighbors. The residential area has an impressive collection of Spanish Revival style homes, this being the most popular style in San Diego during the late 1920s when much of Kensington was built out. Architects Cliff May and Richard Requa built important homes in Kensington, and Requa, in particular, had a profound influence on the architecture and character of the Kensington neighborhood which can be seen today. 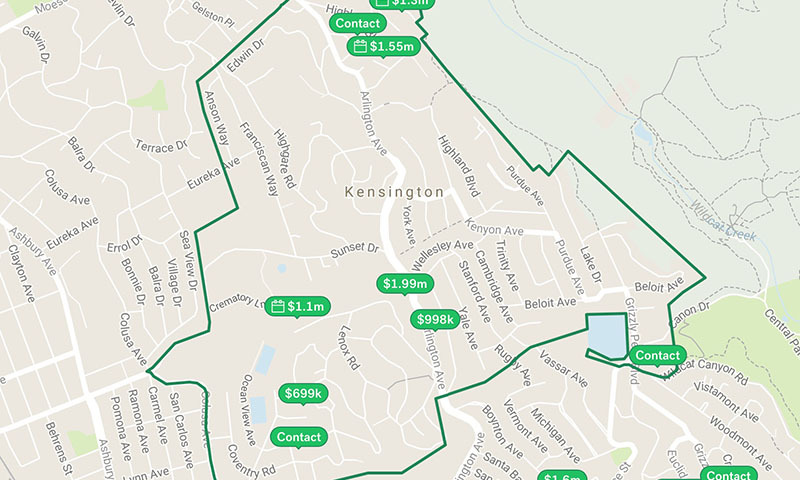 Kensington’s winding streets contain mostly owner occupied, custom single-family homes. Rated an A+ for its access to plenty of amenities by areavibes.com. Amenities in Kensington include nearly a dozen restaurants, a library, a park with a playground, a bank, a couple of salons, an organic grocer, a small gym, a deli and liquor store, an ice-cream parlor, a classic one-screen cinema, and a nightclub that is a destination for cheap drinks, live music, and stand-up comedy. 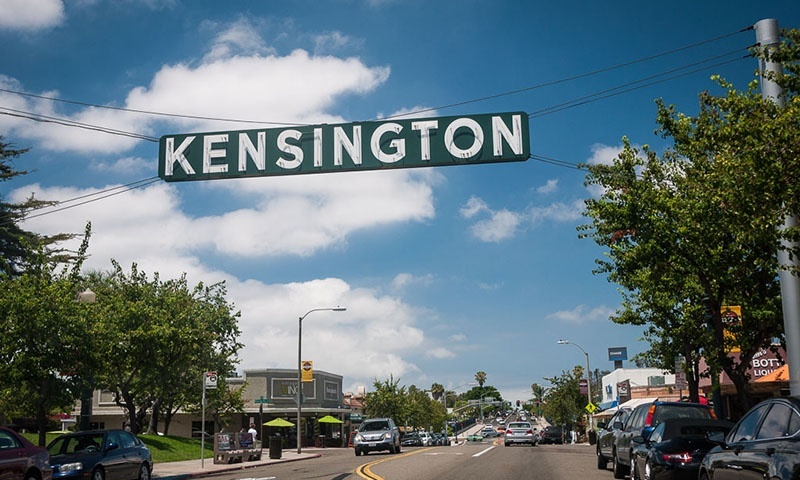 The commercial district in Kensington consists of five blocks on Adams Avenue and is composed of repurposed original houses from the 1910 Kensington Park subdivision, as well as a number of one and two-story neighborhood shops built in the 1950’s. Its central feature is Kensington Park where the public library is centred and considered the heart of the community. The library sponsors great events like baby-sign language classes and story-time for kids (not to mention adult author lectures). The mini-park is toddler friendly and the nice fencing makes it easy to keep an eye on the kids. Franklin Elementary School (which is located at the very edge of Kensington and recently celebrated its eightieth anniversary). The athletic field at Franklin Elementary was recently re-designed and is now open to the public at nearly all hours of the day. Kensington is a tight-knit compact central-community that has everything nearby within walking distance. 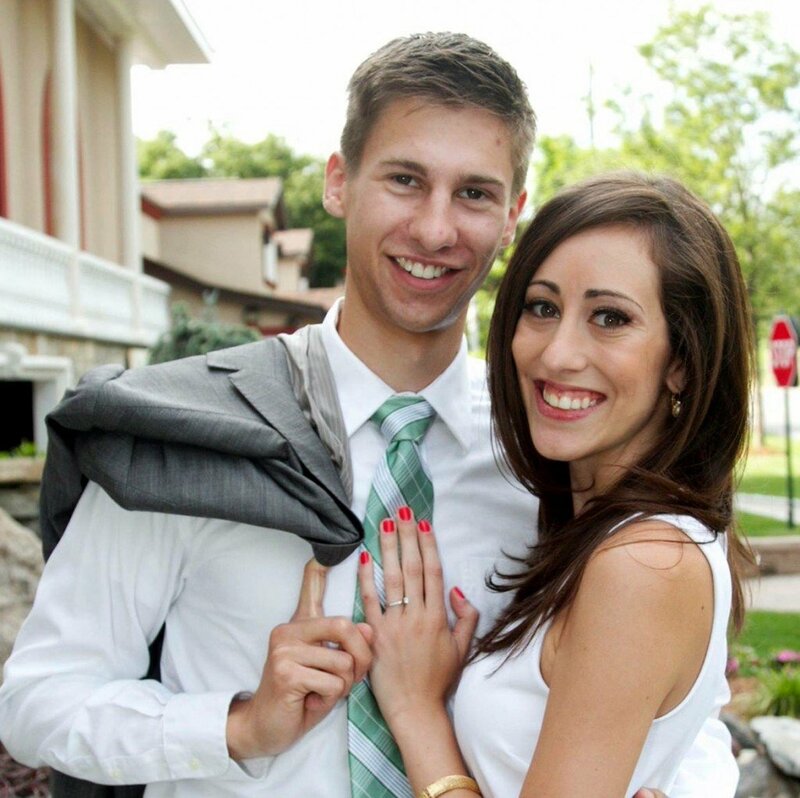 To get to Kensington from I-8, take SR-15 south and take the Adams Avenue exit. Go east on Adams and Kensington begins just after the SR-15 overpass. Commute time to anywhere in San Diego is about 20 minutes. There is an incredible parade down Marlborough every year for Memorial Day and numerous other events throughout the year (including Fourth of July and even around Christmas). Most streets have their own "annual parties” as well. Stehly Farms Market is an extension of farmers markets from Stehly Farms Organics, a 300 acre avocado and citrus farm in San Diego’s North County. The shop offers produce grown locally as well as from other farms in San Diego County. 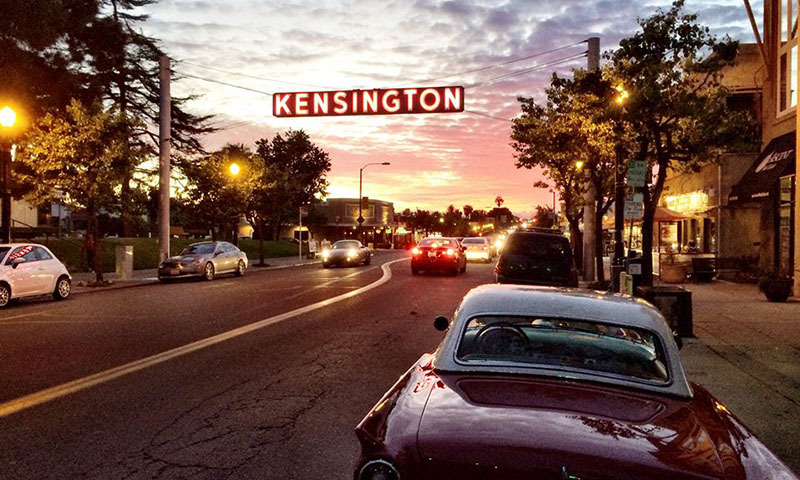 Kensington Club is one of the neighborhoods favourite dive bars which offers drinks and livens up with bands and DJs at night. 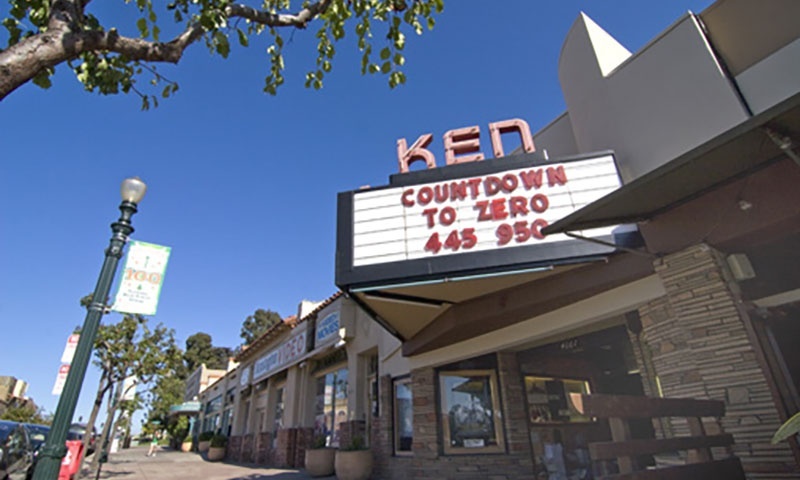 Ken Cinema offers unique entertainment as one of the last single-screen movie venues in the county. Great for watching short, classic and foreign flicks. Beu Boheme is a divine up-scale restaurant that offers French cousin. 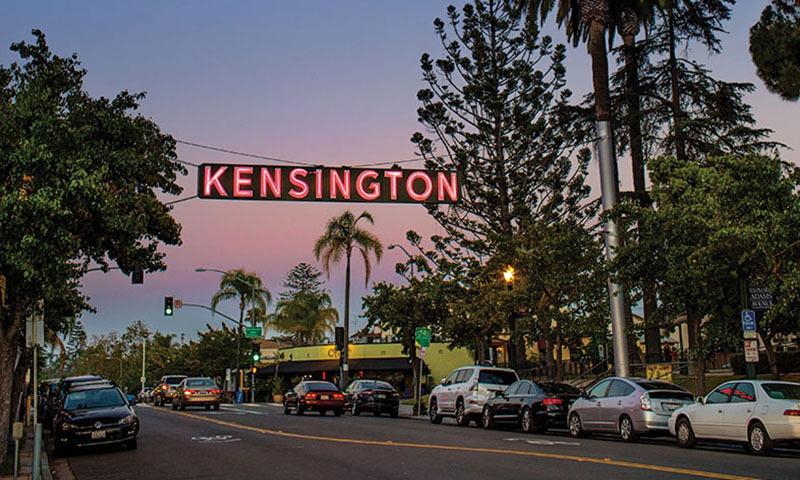 Kensington has a small town charm in a great city with lots of diversity, great weather, plenty of amenities, low crime and a stable housing market all make Kensington a wonderful place to live. 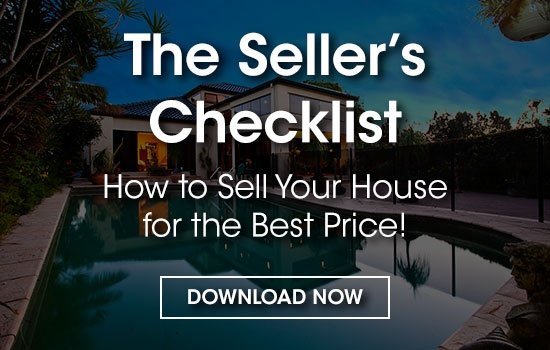 If you're in a position to buy a home in this market, you can't go wrong with Kensington!